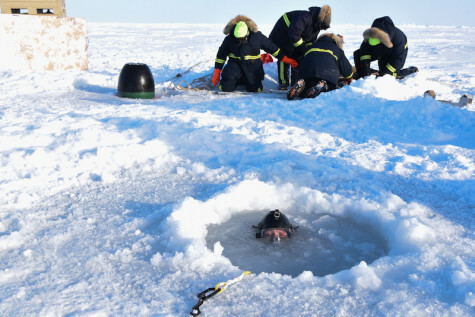 ARCTIC CIRCLE --- Divers from U.S. Navy Mobile Diving and Salvage Unit (MDSU) Two, Underwater Construction Team (UCT) One and the U.S. Coast Guard braved harsh Arctic waters to play a critical role during a torpedo exercise as part of Ice Exercise (ICEX) 2018. "The primary objective of this year's ICEX is to test new under-ice weapons systems and validate tactics for weapon employment," said Ryan Dropek, Naval Undersea Warfare Center Division Newport, Rhode Island Weapons Test Director. "Once the divers recover these torpedoes, we can extract important data about how they perform and react in these conditions."